Please fill out this simple form. One of our radio consultants will contact you as soon as possible. Fields marked with * are required. 221 Chigwel Crt , Unit 430, Toronto, ON m4V 4B9. 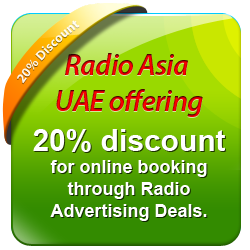 Radio Advertising Deal Provides Radio Planning and Buying Services Covering National and Regional Commercial Broadcasting Radio stations in the UAE, Qatar, Kuwait, KSA, Oman, Bahrain, All GCC, Europe & UK, USA & Canada, Australia & New Zealand, South Asia and Asia Pacific.